The news on Wednesday that Carnival Cruise Line's 2,124-berth Carnival Legend, was caught by 50-knot winds while leaving Cozumel and blown into Royal Caribbean's 2,446-berth Enchantment of the Seas at her berth served to confirm just how busy this Mexican port is these days. In 2008, it handled 1,009 cruise ship calls and over 2.5 million passengers. While these were all transit passengers, this is still more than the number embarked at any major cruise port last year, including Miami at about 2 million. So let's have a look at how the major cruise ports score these days and identify some winners and losers in this big game. Although the two ships touched as the Carnival Legend was blown alongside the Royal Caribbean ship, there were no injuries. There was minor damage to each, including bent railings and broken windows, but both were able continue their intended cruises. What comes as a surprise, however, is that Cozumel is actually now the king of world cruise ports in terms of individual numbers of passengers handled. 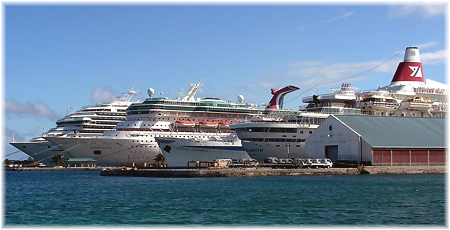 In 2000, Cozumel came fourth after San Juan, Nassau and St Thomas, but today its traffic exceeds all of those ports. It seems that Carlos & Charlie's, that popular Mexican restaurant hangout for many Cozumel cruise passengers, must be more profitable than one might have at first thought. Seriously, though, the area is susceptible to hurricanes such as Wilma in 2005 and Dean in 2007 and one of its three piers, Puerta Maya, was put out of action for more than a year by Wilma in October 2005. This is where Enchantment was berthed as the Carnival Legend sailed from the parallel International Pier. A third pier is located at Punta Langosta. Cozumel will also be one of the ports of call for the world's largest cruise ship, Royal Caribbean's new 5,400-passenger 228,000-ton Oasis of the Seas, when she enters service next year from Port Everglades. For the record, here are the top 25 cruise ports of call FOR 2008 as tabulated by "Dream World Cruise Destinations" magazine. The source for the 2000 figures is G P Wild International Ltd, as produced for "Lloyd's Cruise Review." From these figures, it is interesting to see that while Cozumel has more than doubled its throughput, St Maarten almost doubled and Grand Cayman grown by more than half, Nassau has been standing still (of course, Havana doesn't even come into play yet). 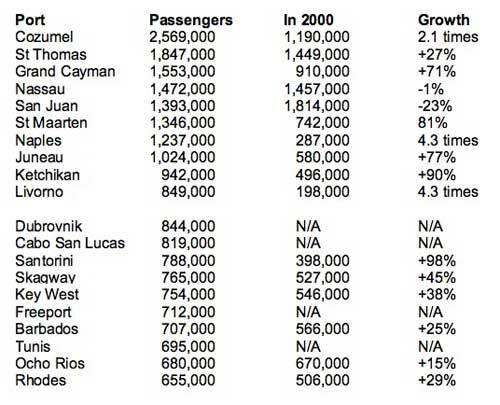 But far worse than Nassau, San Juan has lost almost a quarter of its passenger count as boarding passengers have been more reluctant to fly since the events of September 11, 2001. 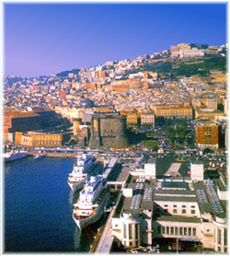 San Juan had previously been a more important embarkation port for southern Caribbean itineraries. And Alaska ports will be losing volumes in 2010, with Juneau forecast for 808,000, Ketchikan for 771,000 and Skagway for 648,000, decreases of 21%, 18% and 15% from 2008, as several lines withdraw a ship each from the trade as a result of the state's aggressive $50 head tax. The most outstanding figure here is of course Seattle, which has seen its business increase by a quantum leap of more than eight times in those years, chiefly since higher cruise ship speeds have meant that they have been able to mount 7-day round voyages despite the extra steaming time from Seattle compared to Vancouver, which is 126 nautical miles closer to Alaska. This is almost 250 miles, or half a day's extra steaming per cruise. 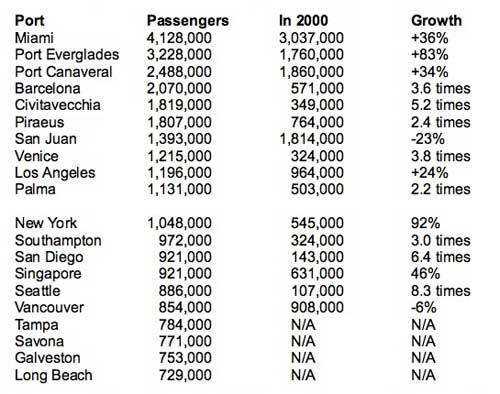 Had Seattle not developed its cruise base, Vancouver would have had something close to 1.6 million passengers, or almost double the volume it is left with. Both ports will suffer next year however because of the Alaska head tax. San Diego has also profited as more lines have decided to base ships at that port, but will not be suffering from any loss of Alaska cruises. Overall, however, it is the growth in cruising in Europe that has produced the really remarkable results, with Civitavecchia, the port for Rome, up more than five times in its cruise passenger traffic and Venice and Barcelona both approaching a four-fold increase. Southampton has tripled its cruise business while Piraeus, despite the demise of Royal Olympic Cruises, has seen its business grow by 2.5 times in eight years and Palma has more than doubled its throughput despite the withdrawal of Airtours from operating a cruise line. Meanwhile, New York has almost doubled its own business as Norwegian Cruise Line made it a year-round cruise port once again while Royal Caribbean built its new Cape Liberty cruise terminal in Bayonne, NJ, and a new terminal was opened for Cunard Line's Queen Mary 2 and Princess cruise ships in Brooklyn. Truly interesting figures, and due to change again as more mega-ships are delivered, and possibly soon, ordered again once the recession is over. It does beg the question of crowded ports however, with little St Maarten with a population of about 60,000 having another 18,000 individuals brought to town on any given day by cruise ships. Whether quality can be maintained is now the big question, and it is doubtful that Carlos & Charlies is part of that equation. Smaller ships such as SeaDream, Seabourn and Silversea, and up to say the size of Oceania, Regent and Crystal now avoid the busiest ports and go to islands that are not part of the mainstream.